Wedding on A Disney Cruise - Believe Vacations | Dream It. Do It. Did you ever want a fairy tale wedding? Most young princesses (especially those who grew up with the Disney classics) always imagined that storybook “happily ever after” moment where you find your true love and celebrate your special day with an event that would make the whole kingdom talk for years to come. In true Disney fashion, they have found ways to provide marriage ceremonies on their various campuses and cruise ships. And because Valentine’s Day is this week, we need to talk about one of those options. Welcome to Believe Vacations’ most romantic post of the year as we discuss having a wedding on a Disney Cruise. It’s a pleasure to introduce Agent Jennifer Garthe. Jennifer has been with our team for 6 months now and is one of the lucky ones who actually got married on a Disney Cruise! It’s okay to be jealous of her. Not a lot of people get a chance to say they were married in that way. But like any great agent and friend, she made mental notes of her big day so that we could share it in a future article. That time has come and let’s fall in love all over again as we check out true romance. Thanks for sharing about your special day Jennifer. We have to start with your love for Disney. It started with my first visit when I was almost four & have continued from there. I spent my 16th birthday there, Grad Night, participate in the College Program all at WDW & now, I’ve been a passholder for four, almost 5 years. for me, & St. Petersburg for her) After graduation I moved down to St. Pete & one of the first things I bought after getting a new job in my field was WDW Annual Passes for both of us. Does your spouse have the same Disney love as you? No, for her it’s a fun thing to do occasionally, but it’s not her love. She’s happy Disney makes me happy. Had you or your spouse ever been on a Disney cruise before? Yes, we have been on two 3-Day Bahamian Cruises on the Dream together in 2017. What day did you get married? We signed our marriage license on Deck 14 at Outlook Lounge Monday, December 10, 2018 at 3pm after we boarded, but before we sailed away. Then our ceremony was on Tuesday, December 11, 2018 at 3pm at the Meridian Patio Deck 12, Aft Starboard Side. Love it. Have to ask though – Most young ladies dream of a traditional church or courthouse wedding that had some sentimental value growing up. What was the spark to decide “this is where we’ll get married?” Riva is more of a Courthouse Wedding type, & I’m more traditional. This was a compromise so I could have a ceremony, but it was intimate & small so it wasn’t overwhelming for either of us. Plus, it was less expensive than a regular wedding & it allowed me to have some Disney without being too much Disney for her. What is the process of letting Disney know you want to get married? The wedding is added as a package to your cruise when you book. So I called & confirmed that a wedding was available on the sailing date I wanted, booked the cruise and wedding package, and at the same time paid the deposit which was a percentage of the total including both the package & the cruise. Does a Cast Member work with you? A coordinator from Fairytale Weddings contacts you. They give you a packet and you fill it out & return it no later than 30 days before you sail. I also followed up with any questions on the phone & via email with my coordinator. needed our Passports & our Marriage license. 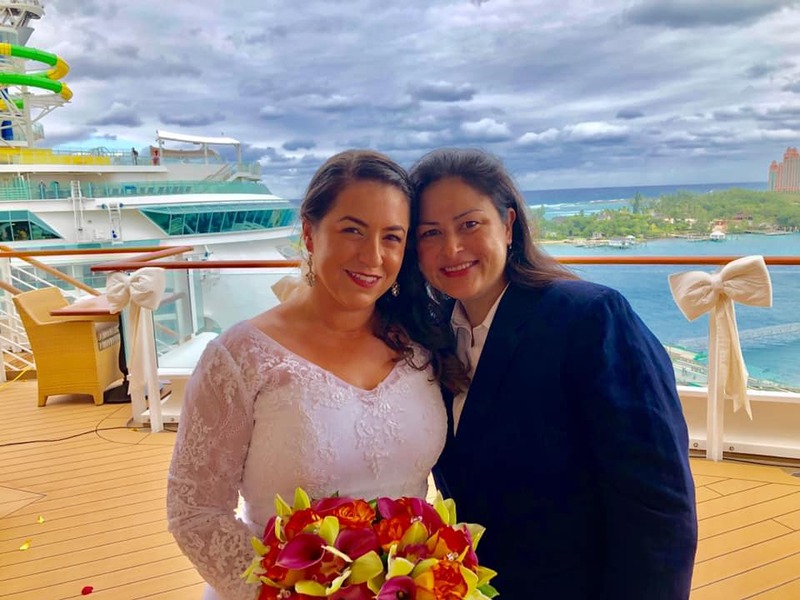 The legal part of the wedding must be completed before the ship leaves home port on Embarkation Day, because Senior Officers are not able to perform legal ceremonies. You, as the couple, are responsible for obtaining & bringing the marriage license. They provide you with some info about nearby county clerk’s offices for out of state couples, (waiting period is waved for out of state couples) but we just went to our local office (after taking our marriage course to waive the waiting period & reduce the fee) & brought the marriage license with us. Also, the couple is welcome to take care of the civil ceremony at home & not have the civil ceremony on embarkation day. Enchanted Garden because I thought they looked pretty & she made that happened too. 3- I asked if we could get into Palo Brunch. We were told we were first on the waiting list but I guess no one cancelled so no luck there. Anything special for your room or should I say, honeymoon suite? In our room when we came on board was a beautiful & really amazing fruit basket which we nibbled on for days. After our ceremony night, they decorated our room really cute with flowers, swan towel animals, chocolate covered strawberries, & champagne, and we received several gifts which included the cake cutters, a beach towel, a beach bag, and a Our Happily Ever After decorative pillow. So you were basically celebrities? People would recognize us somehow & tell us Congrats on the ship frequently. Also, the couple gets their wedding outfits steamed & Riva wasn’t sure exactly what she was going to wear, but our coordinator had her lay out her three things she was considering & had them all pressed so she could not stress & decide at the last minute. Did any family and friends come along? My Dad & my sister came. video. Then, we were announced as a couple. We moved on to our cake cutting & feeding each other cake, drinking champagne, having our first dance, dancing with my dad & then we were done. the wedding time not 10 am. Also, a random note, my makeup looked great, but it felt more like a friend doing my makeup with her personal makeup rather than at a makeup counter with a dedicated line that they had setup to use and sell. I wasn’t expecting that and given that, I’d probably purchase my own fancy new makeup and do it with my sis rather than having it done. It looked great though. My dad got us the Senses Spa Villa. This was super luxurious & really nice. We both enjoyed it, and I’m still dreaming of another massage like that. I just thought this was a really random question but if it’s at sea, where does the marriage license say it’s from (State of Florida?) Yes, we got out license in Pinellas County, so it’s state of Florida. Was it everything you ever imagined? It was sooo amazing. I loved our cruise & the wedding memories will last a lifetime. It was about as stress free as you can imagine & on board, I felt that they really tried to make it as memorable trip as possible for us. I can’t wait to plan another Disney Cruise, but on a new exciting itinerary to discover! – On-site ceremony coordinator to coordinate your ceremony day events She was awesome! Her name was Caroline & she really made us feel special. -Choice of personal fresh floral for the couple (You may also opt to include floral for your bridal party, available at an additional cost) We had two bride’s maids bouquets, one for each of us. In retrospect I wish I just got one big bridal bouquet because Riva had no interest in carrying one, so I mostly carried two! -Solo musician (pianist) for the Ceremony and Cake & Champagne Celebration- He was great! He was the pianist who played all over the ship & he could’ve taken requests if I had any last minute ones. Also, he found the Happily Ever After Song on my phone & played it at the cake/champagne part, which was awesome! -Cake & Champagne Celebration on-board the ship which includes an elegant wedding cake, one bottle of champagne and one bottle of sparkling cider (non-alcoholic) for the toast, served by host or hostess- Probably our only complaint & something I’ll prob call our land coordinator about. Here’s the story: There’s an option of included cake or an upcharge cake for $250. I read that the cake can’t go off the ship & back on but, since we weren’t getting married off the ship I assumed we’d take some to our rooms or they’d take it to our rooms for us. I didn’t remember to ask about this at the ceremony. Unfortunately, we each got two slices of cake- it was so good!!! And then we never saw it again. Had I known either we needed to grab it or loose it, I would’ve made my family do that. -Dinner for the couple at Palo on night of ceremony- Oh my gosh, first time here… so good! –Steaming for the couple’s ceremony attire- Again, Caroline went out of her way to be accommodating on this picking it up from our staterooms for us. bought a package. I didn’t get it & kinda wish I did.